As the year progresses, Paisley finds making friends easier than she imagined. Things seem to be going well until her mother returns for a surprise visit with a new get-famous-quick scheme she promises will be the big break for both of them. She leaves Paisley torn between her instincts to protect her mother and her desire to pursue her own future. The pressure is on for Dusty. Her only hope of convincing her Daddy to let her study geology in college is to do well at finishing school. It’s not a good time to push him, but when Dusty discovers that her father and Paisley’s mom have an unresolved quarrel, she can’t seem to leave it alone. Why won’t anyone just tell her the truth about things? Paisley isn’t sure she knows what happened between her mom and uncle years ago, but she is sure that the man who sends shivers up her spine just by meeting her eyes is someone she has no business falling for. She tries to hide her feelings from Dusty. After all, she’d never act on them. So maybe saying nothing is best. She doesn’t want to lose the closest family member she has, and that’s exactly what would happen if Dusty knew. Sweet Dreams is like a cool glass of lemonade on a hot summer day. The story welcomes its readers in like the big-hearted Texans who fill its pages. Stewart again displays a mastery of character in her depiction of the two young southern ladies whose passion and vulnerability make them simply unforgettable. Kissing. Paisley remembers an encounter in which a man tried to take advantage of her. She is obviously scarred by the experience, but no details are given. As Dusty struggles to understand the mystery surrounding her mother’s death, she is reminded to quiet her heart and trust God. A woman is injured when a bridge collapses. Description is brief. The girls occasionally smoke cigarettes. Paisley remembers her mother and her mother’s boyfriend smoking marijuana. Tagged 1960s, 60s Era, Carla Stewart, Sweet Dreams, Texas. Bookmark the permalink. Colleen, thanks for the comment. I do remember you! Hope that the writing life is going well with you. And if you get a chance to read one of my books, please let me know how you liked it. Thanks, Kasey, for the terrific review! I have great memories of ACFW and meeting you – I think we chatted in one of the classes. 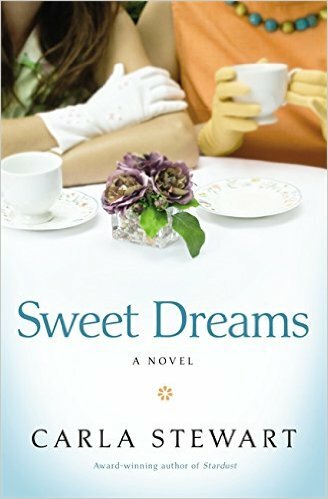 I so appreciate your taking time to read Sweet Dreams. I like to tell folks to Dream Big! True in life and in fiction. Blessings. You’re so welcome! Well-deserved! 🙂 Amen to that. This is the first time I have read a review of Carla’s work, and I am so pleased!!! I met her at my one and only ACFW conference, and she had just gotten an agent. She was/is such a warm, humble person, and I am seriously thrilled you gave her book this review. Awesome!! Thanks so much, Colleen. I’ve also had the pleasure of meeting her, and I agree. She is so encouraging, warm and friendly. This is the second novel of hers that I’ve read, and I enjoyed both very much. 🙂 I think you’d like her debut Chasing Lilacs as well.